Setting the scene. 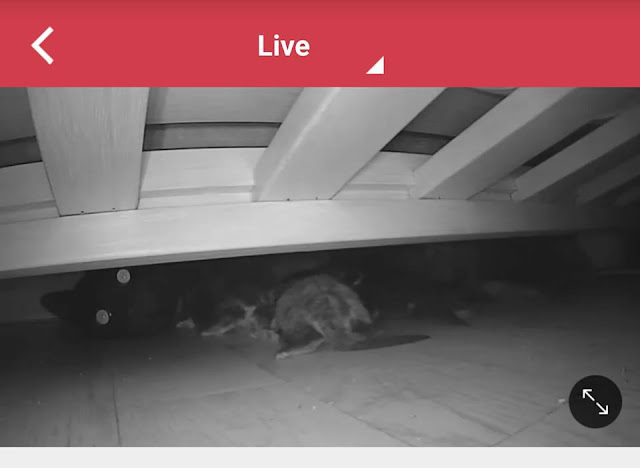 I am laying in front of the futon couch, "Skinny" is lying in the space behind the couch with her six kittens between us but snuggled up to her belly. Her back foot is laying out under the lower bar and is closest to me. Mom is growling. She always growls. I talk softly to her, tell her that she is safe, she growls. I tell her she's a good mom, she growls. I told her she makes good babies, she's silent. I close my eyes and think happy cuddly thoughts, imagine scritching her ears and the side of her mouth. I imagine rubbing under her chin, and like my own cats, my imaginary snuggle session with her she turns her head to make me scritch the side of her face again. I imagine cooing words of love in her ear and kissing her forehead. I open my eyes and see her staring at me. Her foot is fairly close, I reach out. I touch it. I slyly look to make sure she isn't overly upset. This is not the first time I have touched her back foot. If she is being nursed on I can even rub her foot before she'll pull it away from me. Because of her yelling at me last night over the theft of her baby, I am cautious. Very cautious. She props herself up with her front legs to move her mouth closer to my hand. I pull my hand back under the bar to make it hard for her to bite me. She lays back down since propping herself up disrupts her kittens. I saw her start to make biscuits with her front paws - which has a full set of sharp pointy claws. I reached out again and attempted to massage her foot. She reached over again, trying to see what I was up to. I wanted to offer her my hand to smell, but the display of claws and the recent growling has me leery. I put my hand up to the bar, so if she is mad she will have a hard time actually getting to me, and she sniffed and then laid back down. I was hopeful. I rubbed her back foot again and she seemed curious. I moved my hand up towards where her head was but keeping all biteable parts of me safe. She sniffed. Because of how we were lying, I wasn't able to see her face or what was going on, but I did feel her reach out to touch me with her paw. She was very gentle and slightly hesitant..
My eyes started to leak. WOW! And... wow! You've got a mission now. Oh my ... must be dusty today ... eyes leaking here too! Pawsome news! We are so happy. May the trust build. Oh! I'm so happy to hear this! I have "Ready Player One" but have never read it. I'm so going to read it next! <3 Love these kind of moments. Yay! She will be a much happier healthier girl her whole life because you're working on her like this! We held our breath reading this whole thing. Yay for the little steps! Can you feel our smiles? Oh how wonderful! Baby steps...hopefully she realizes soon that you are to be trusted. Especially when those babies start running all over the room. Great news - you are getting there, slowly but surely - keep up the good work!! That was lovely -- I think I have something in my eye. I *totally* admire your patience! I think my eyes are a little wet too! Good work Connie. You are all heart.